Solid braking with two 160 mm mechanical disc brakes up front and a linear pull brake on the rear, important considering the 140 lb weight of the bike! 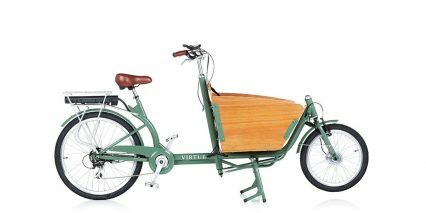 Kenda K-Rad K905, 24" x 1.95"
The human powered Virtue Cycles Schoolbus was one of the first models created by founder William Mulyadi. 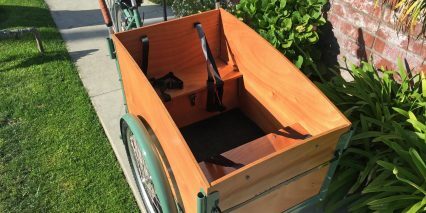 It was designed to be stable for loading his kids, positioning them out front where he could keep an eye on them and have conversations during rides vs. behind in a trailer or rack mounted seat like the popular Yepp Maxi. 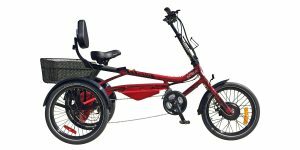 He didn’t enjoy looking back frequently, straining his neck and compromising his steering position, and felt that their chats were interrupted… Unlike many of the other single-rider upright electric trikes I’ve reviewed, the Schoolbus wheel pattern follows a tadpole layout much like a recumbent trike. 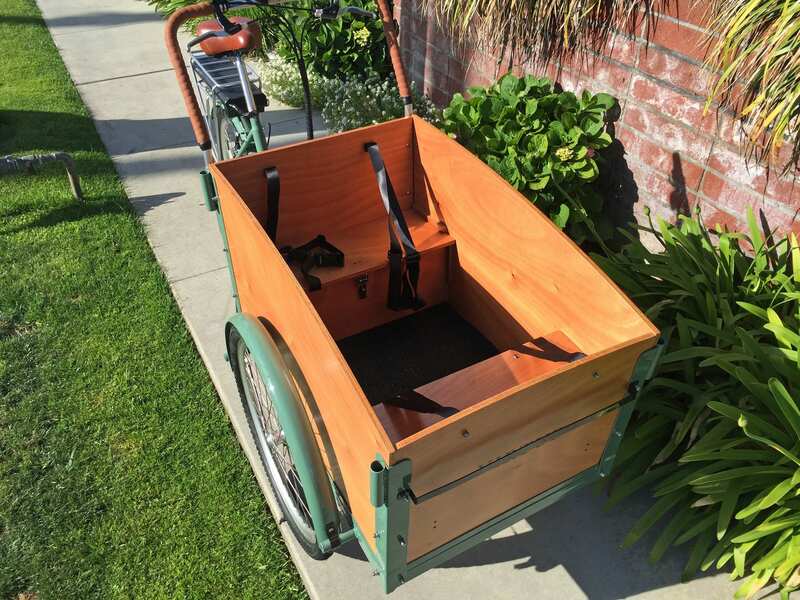 With two wheels up front and one in the back, the wooden cargo box (which can accommodate up to four small children) can be larger than that used for the Gondoliere+ but maneuverability and speed are sacrificed in the process. Basically, you haul more with the Schoolbus+ and it’s stable but handling takes more effort and speed is sacrificed… it’s also just a lot heavier than that model at over 140 lbs. 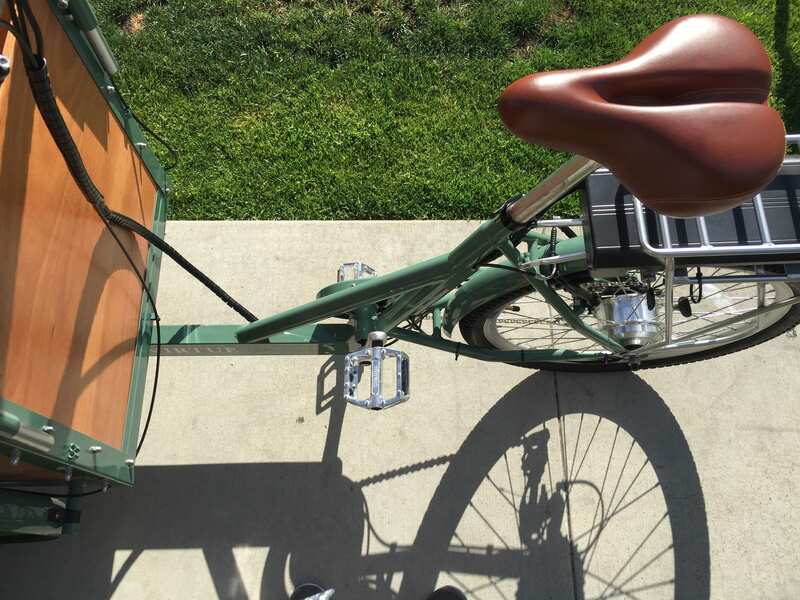 Steering and handling the Schoolbus Plus is very different than most of the other electric bicycles I’ve test ridden because the bar is connected at both ends and swings wide to each side vs. twisting in the middle. I found myself walking the bar out slowly and occasionally using one hand for sharp turns. It wasn’t as precarious as it may sound because again, you’ve got three wheels on the ground to stabilize you at all times. It does take some arm strength though, because the bar is turning the box, cargo and front wheels. 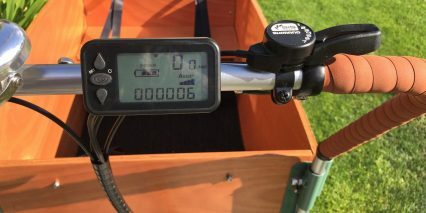 The cockpit isn’t especially crowded or complicated with standard brake levers, a classy bell, thumb shifter on the right to navigate seven speeds and a basic LCD control console. Many of the components and parts used on the Schoolbus+ and Gondoliere+ felt cheap to me but the price point on both is incredibly low. 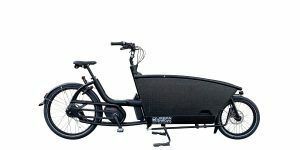 Seven speeds isn’t a lot but with assist it’s enough to get around the neighborhood… unless you have medium or large hills. 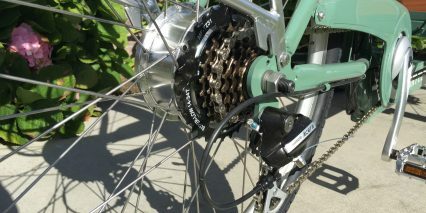 The shifter worked fine and Shimano Acera derailleur is two steps up from base, one complaint I have about the display is that it can be difficult to reach when mounted in the center (as shown in the video and images here). I had to take my hand off the left grip to arrow up and down into different assist modes. I also wasn’t able to figure out switching from kilometers to miles or back lighting. 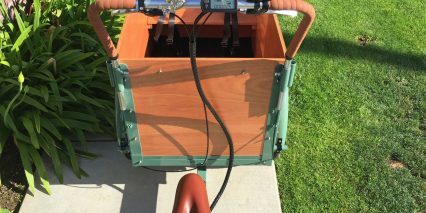 Lights are definitely something worth adding to this ebike for early morning and evening use. 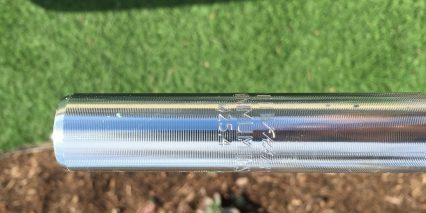 Virtue Cycles sells an optional shade canopy tent thing that covers the box but I didn’t get to look at it and am not sure how much it costs… ask about it if you contact the company. Apparently it’s made of canvas, has windows and a zipper for entering through the side. 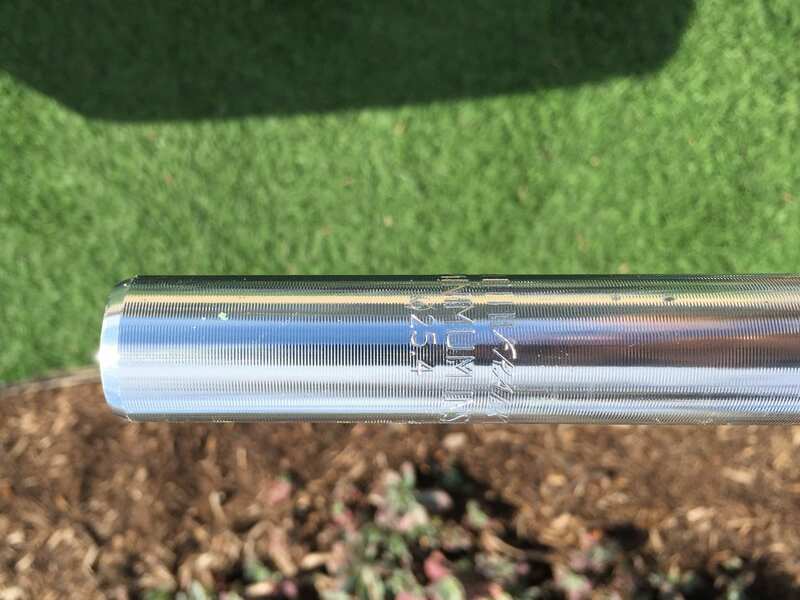 You can also roll it down in the front and tuck into the metal bar shown in the video. Buying this bike isn’t as straight forward as many others I test at local shops. 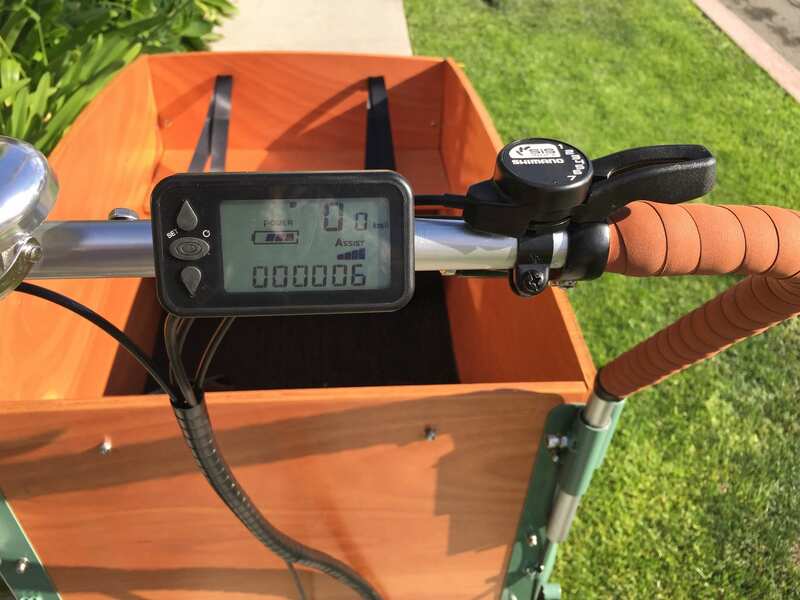 Because it’s large and heavy, shipping costs may add up and unless you live in the Southern California region or are willing to do some driving you may not get the chance to take a test ride. 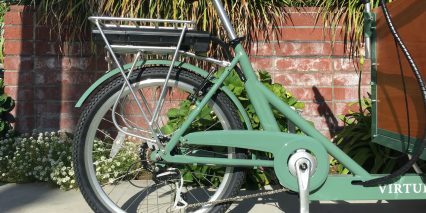 It only comes in one color (a unisex Atlantis Green) and one frame size but the low-step frame is very easy to mount and the seat drops low so I feel that this bike would fit a wider range of riders. 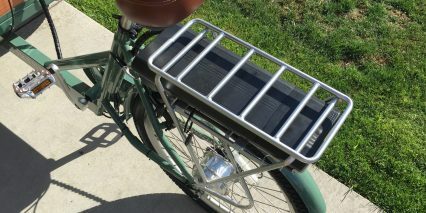 I love the matching steel fenders and chain guard as well as the battery-surrounding cargo rack with pannier blockers! 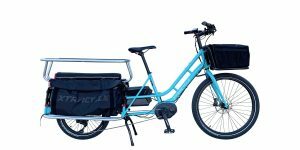 You could easily add a set of panniers like this for additional personal cargo space or groceries if the front box was dedicated to kids. 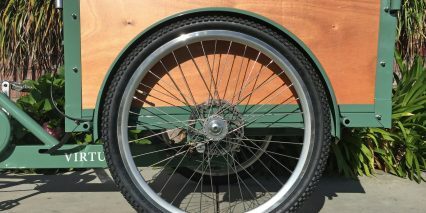 Due to its size and unique wheel layout, the School Bus might be difficult to lock onto traditional racks (go for the end of the rack or lock to a tree, railing or post). 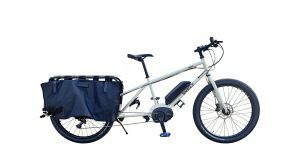 Despite its heavy footprint and large size, the motor and battery on the Schoolbus+ are minimal and efficient. 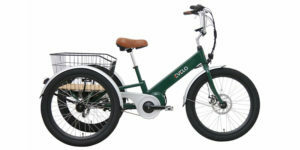 This is a pedal assist only, Class 1 electric bike. 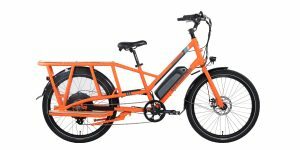 Since it doesn’t have a throttle, you end up getting better range and not working the motor so hard which means the 250 watt geared hub and 36 volt pack (both below average for what I see on a lot of single person ebikes in the US) work surprisingly well. 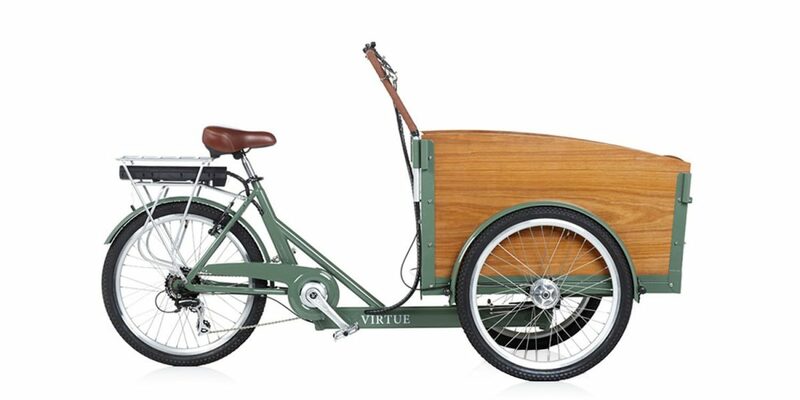 Again, this is not a fast electric bike, topping out at maybe 10 to 15 mph? But due to the unique steering and somewhat basic braking I wouldn’t want to go much faster. 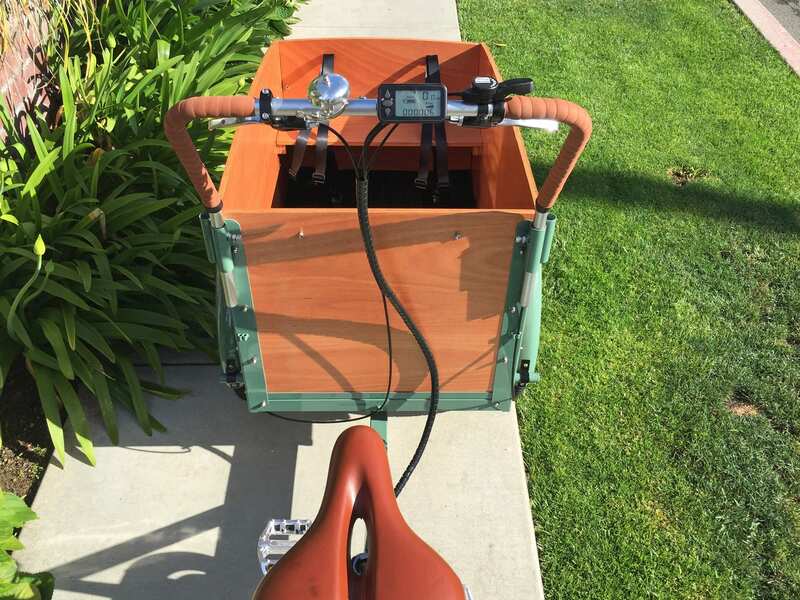 The motor activates based on pedal cadence not how hard you push, so once it begins spinning all you need to do is continue pedaling lightly to get assistance. 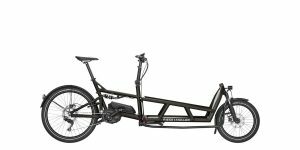 The downside is that STARTING the bike can take some real strength and unlike bicycles with internally geared hubs, you cannot shift at standstill here so plan accordingly! Shift down before stopping at lights or stop signs. This is where the basic shifter becomes tiresome vs. triggers or for some a twist grip which might be more intuitive. 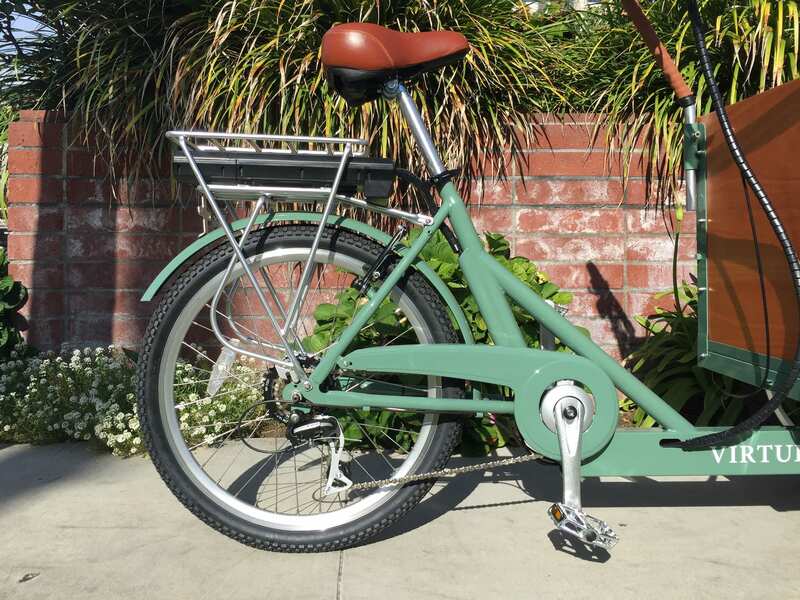 Do you think this bike would be able to fit a taller (6’4″) guy? Hi Peter, yeah I think it would be alright but you might want to raise the saddle to max height. The seat post diameter is a little unique here at 25.4 mm so I’m not sure how easy it will be to find a longer post… but with the unique steering and a bit of seat adjustment (up and back) I think the bike would be enjoyable for you to ride. It might feel very upright to you but I think you’d have decent leg and knee clearance. Hope this helps, feel free to post an update if you decide to move forward with a purchase. I’d be interested in your hands-on feedback. I have owned this bike for over a year and have ridden 1,000+ miles on it (which is a lot for a bike this heavy). I think the review above is pretty spot on, a few additional thoughts and comments. 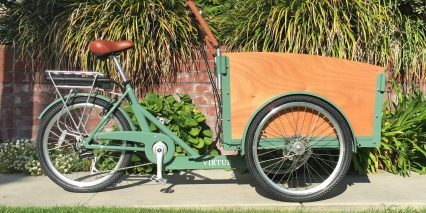 Overall: I use this bike principally to take my son to school/errands/beach (we are in SoCal about 25 blocks from the beach). This bike is perfect for that. 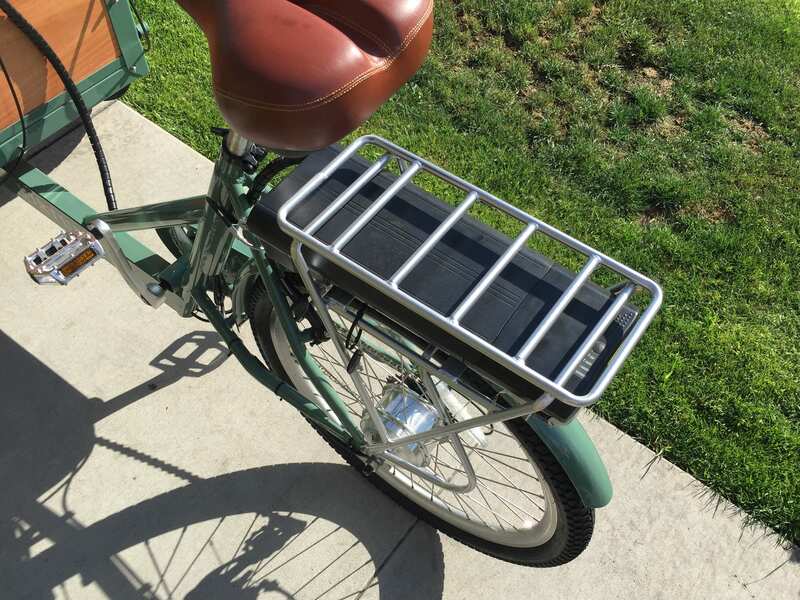 We can take the bike almost all the way to the ocean, lock it up to itself (don’t need to lock it to a post on the beach because it’s so heavy no one is going to be able to drag it away), avoid the hassle of traffic and parking. My son loves being able to sit up front in the “catbird” seat. I have had 5 kids in the front and it handles the load fine at low speeds. So overall rating is positive. We get all kinds of waves and admiring comments. You see a surprising number of these in Santa Monica and Venice. The bike is HEAVY. Between me, my son, the bike and our gear, we weigh in at about 400 lbs. Don’t get the non-electric version unless you live someplace completely flat (Amsterdam? Florida?). 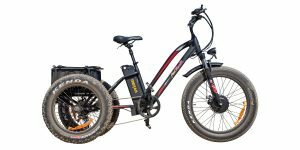 I can go on the flats and up very slight slopes without the electric assist but that’s a real workout. 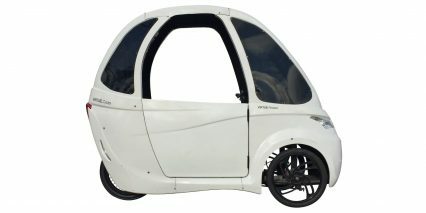 Anything that has any grade will require the electric assist or you are pushing the thing on foot. Don’t plan on going more than 14-15 miles an hour. The steering starts feeling unstable at that point. I got up to 18 mph once and it was pretty scary. 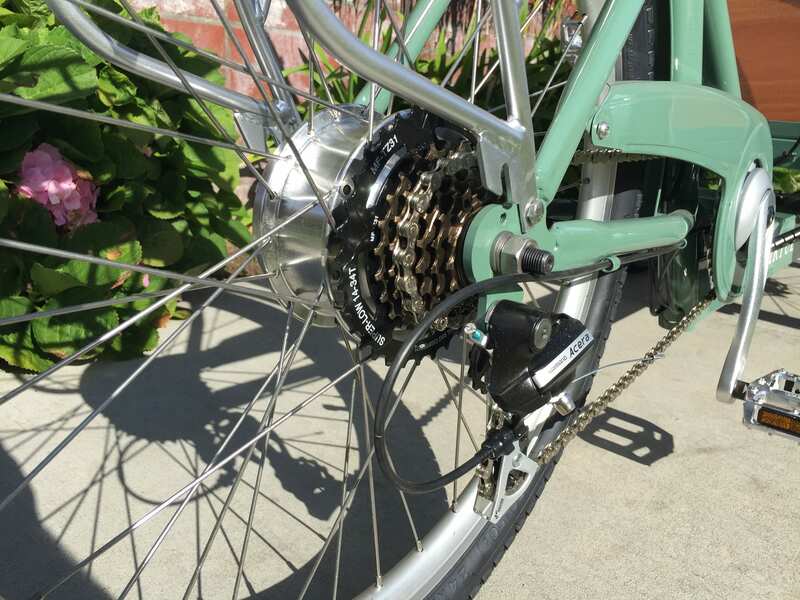 The brakes work but given the weight of the bike it takes some time and distance to slow down to a stop, so you have to plan for that. 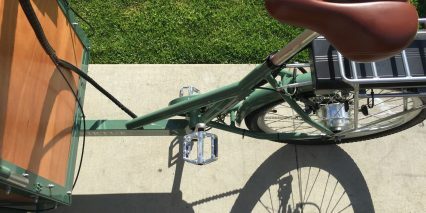 Hydraulic brakes would be better but that costs more. Getting the bike serviced is a hassle, given its size. Around here the bike shops don’t have a lot of storage space so no one wants to store it overnight, you have to drop it off and pick it up same day. 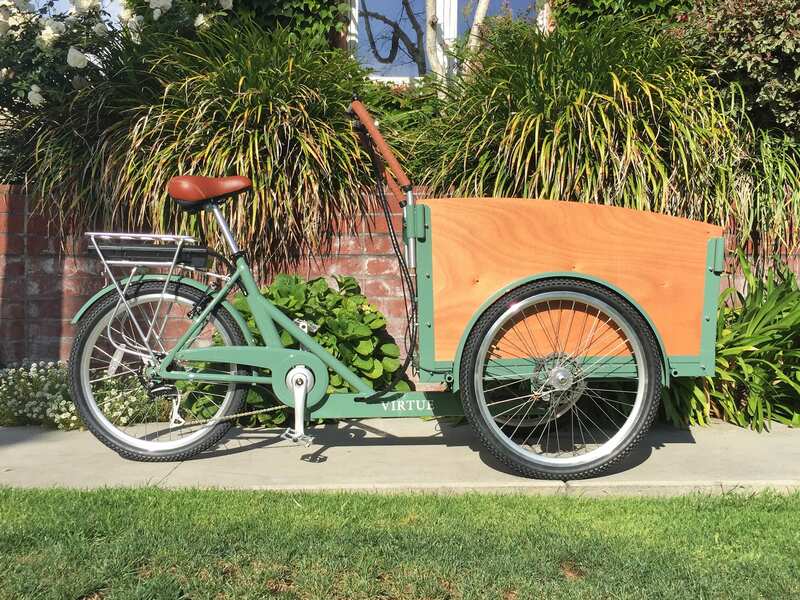 If you want to transport the bike to the shop you will need a truck or a trailer. I have a truck and built a homemade ramp so I could get it in the bed by myself but if you don’t have access to a truck, think about your plan for getting it to the shop. 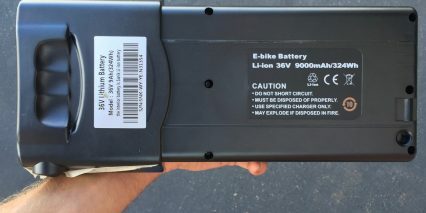 In order to hit the price point, the manufacturer had to make some compromises. I wish there were more gears available at the lower end. I have had major problems with the rear wheel. 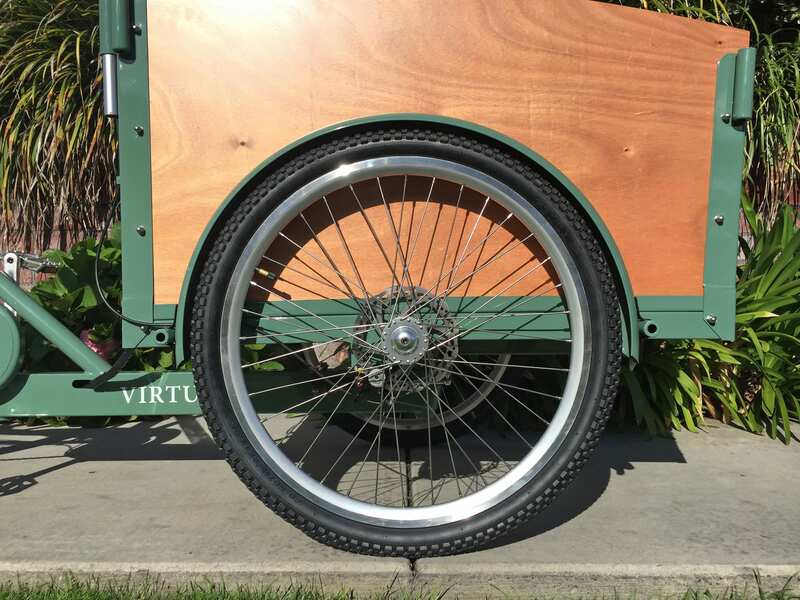 The spokes on the rear wheel are inadequate. I have had at least 10 break. The manufacturer was kind enough to sell me some replacements but they are almost gone. I have had to search all over the internet for 12 gauge spokes of the proper length and am going to have to order a whole set and pay a mechanic to rebuild the rear wheel. Probably he will have to drill out the rim a bit to accept the larger thickness. Hopefully the larger gauge will put an end to this problem. I tripped on the charger cord (my fault) and broke the plug that goes into the battery for charging. 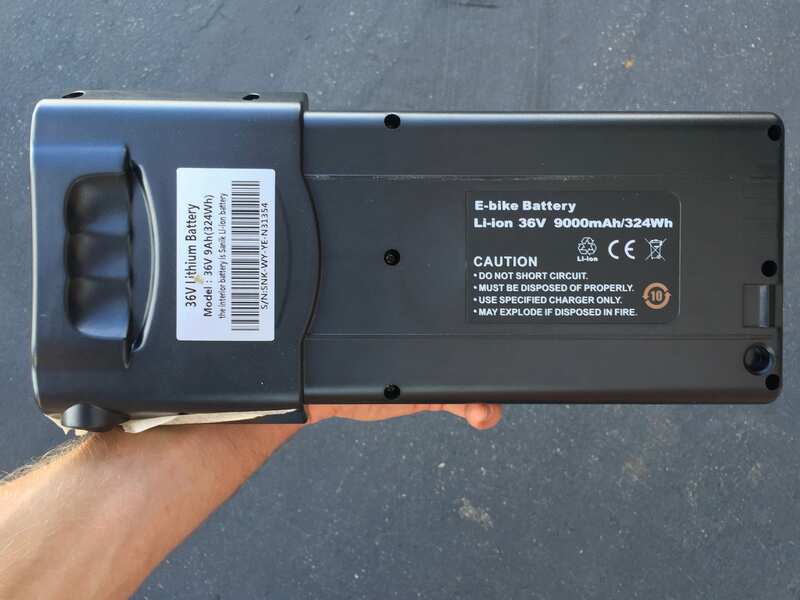 I tried to call the manufacturer to purchase a replacement charger but got no response. I ended up having to do some research on the internet and bought a replacement plug, cut the cord and spliced on the new plug. That worked out ok, but if there were a major problem with the electric system, I don’t know where I would turn to get it fixed.